There are nearly 23 million veterans in the US today and many of them face different health issues as a result of their military service. The Veterans Health Administration (VHA) issued a directive to make medical ID bracelets and pendants accessible to all veterans. Under this directive, veterans can claim a custom engraved medical alert bracelet or necklace in 4 easy steps. The VHA covers the full cost of medical IDs provided to veterans under this directive. American Medical ID made this short video to help raise awareness of this benefit and make it easier for veterans to claim their life-saving medical ID. Please help us reach as many veterans as we can by giving this video a thumbs up and sharing it with your social media networks. Medical IDs contain pertinent medical information such as allergies or diagnoses that are valuable to emergency health care providers. 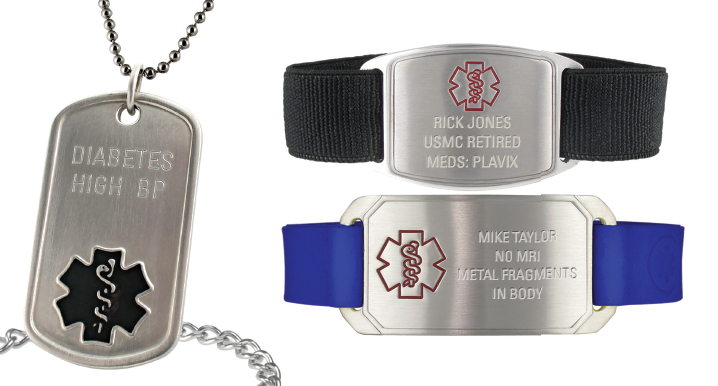 All medical ID bracelets and necklaces that are available for veterans are custom engraved, personalized to their wearer. No two people are alike, so medical IDs shouldn’t be either. Veterans: There are 4 Easy Steps to Claiming a Veterans Medical ID. The Centers for Disease Control and Prevention (CDC) reports that veterans are significantly more likely to have two or more chronic diseases. Examples of chronic diseases include diabetes, heart, and kidney diseases. According to the US Department of Veterans Affairs, chronic kidney disease is common in the veteran population. It is estimated to affect one out of six Veterans receiving health care. The department also reports that nearly one in four men and women (24 percent) who served their country have diabetes. For perspective, it is estimated that 9 percent of Americans have diabetes. Post Traumatic Stress Disorder (PTSD), depression, and Traumatic Brain Injury (TBI) are three primary mental health concerns of veterans according to the National Alliance on Mental Illness. Along with anxiety and depression, these mental health conditions are considered as invisible illnesses or conditions. Wearing a medical ID plays an important role in providing pertinent mental health information to emergency responders. American Medical ID works directly with the Veterans Affairs to provide medical IDs at no charge to veterans. If you are a veteran or know of someone who is, please help us spread awareness on this important benefit. Do you need help in claiming your veteran medical ID? Please leave us a comment now with any questions we can help answer. Med IDs for Veterans, Med IDs for Vets, medical ID, PTSD, VA Policy, Veterans, Veterans Health, Vets. Bookmark.